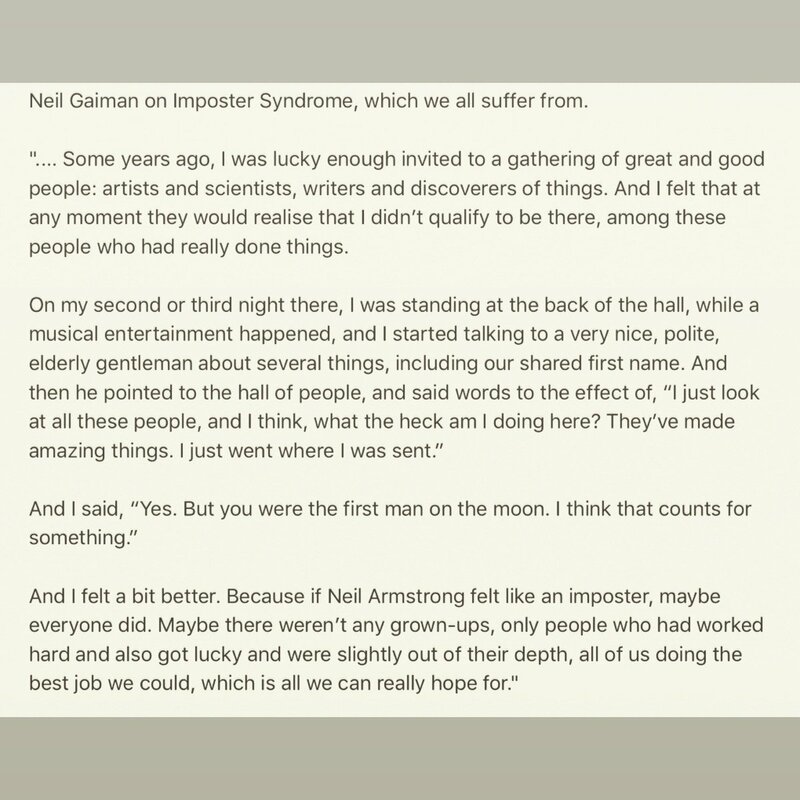 Impostor Syndrome is the feeling of not deserving to be in the position you are, and of being afraid that advisors, instructors, or peers will come to realize that you are not as capable as you may seem. The effect can be harmful when it selectively reinforces negative messages and causes people to try less hard because they are convinced they are incompetent when they are not. That someone as intelligent and capable as Ed Bertschinger could confess to having such feelings will surely help others counter the negative effects these self-doubts might have on their careers. In the piece he reveals figures that show that Impostor Syndrome is pretty commonplace in academia, though more prevalent among females than males. Sarah Kendrew has blogged about this from the perspective of a younger researcher. Impostor Syndrome has certainly accompanied me all the way through my academic career. It started as early as the 11+ examination to get into the Royal Grammar School. I was quite a backward child when I was very young – I didn’t learn to speak until I was three – and assumed that taking the examination would be a waste of time and I would go to the local comprehensive along the rest of the kids. In fact, I passed, and got a scholarship without which I couldn’t have gone, but was convinced that I only got in because of some form of adminstrative error. During my first term at RGS I was overwhelmed by feelings of inferiority and struggled at almost every subject. I kept at it though and surprised both myself and my teachers by doing rather well in the examinations. It was all very similar when I went to Cambridge. Nobody from my family had ever gone to university before, never mind Cambridge, and I assumed I’d fluked the entrance examination there as well. I took it for granted that everyone else was cleverer and better prepared than me, but I gradually realised that wasn’t true. Some were, of course, but I found that if I worked hard I could do OK. I admit I was a bit erratic as student, but I always thought it was better to be good at some things than average at everything. In parenthesis I’d say that I think the Cambridge style of examinations was kinder to people like me than the way things are done in most places now, in that it didn’t involve a straight average over papers. The same pattern emerged when I began graduate studies at Sussex. I felt woefully unprepared to work in cosmology, especially since many of my supervisor’s other DPhil students had completed the fiendish Part III Maths at Cambridge before starting their postgraduate degree. I was fortunate in being given a problem that suited me – and I should say received excellent guidance and advice from my supervisor, John Barrow. Despite going through some frustrating periods when I thought I wasn’t going to get anywhere with my research, I completed in less than three years. Thereafter I got postdoc position, an SERC Advanced Fellowship, a permanent position at Queen Mary, and then a Chair (at Nottingham) by the time I was 35. Looking back on all these successes the only thing I can attribute them to is outrageously good fortune. There are many cleverer people with far stronger technical skills than me who either took much longer to get a permanent job or who haven’t yet managed to do so. At times I marvel at my own good luck, at others I feel guilty about others who are clearly better than me but haven’t been so fortunate. I guess they probably resent people like me, but it’s best not to think of that. The bad thing about having feeling that you’re an impostor all the time is the constant fear that you’ll be found out and be subjected to all sorts of humiliation and, worse, that you’ll find someone relies on you for something that you’re unable to deliver. The latter is especially stress-inducing if you work a lot in collaborations. However, there is a good side too. I think a bit of self-doubt actually makes one a better person, in that knowing your own weaknesses helps appreciate better the qualities that others possess and instils a desire to help nurture the talents of people around you, especially the younger ones. When students ask me for advice about scientific careers I usually say the usual things: work hard, choose your problems wisely, make connections, believe in yourself. If I were being completely honest, however, I’d say that I really believe that the most important thing is to be lucky. Ps. The wikipedia page on Impostor Syndrome also includes a reference to its converse, Dunning-Kruger Effect in which “incompetent people find it impossible to believe in their own incompetence”. I wonder if this might be even more prevalent in academia? This entry was posted on January 6, 2012 at 1:05 pm and is filed under Biographical, Education with tags Ed Bertschinger, education, Impostor Syndrome. You can follow any responses to this entry through the RSS 2.0 feed. You can leave a response, or trackback from your own site. what a brilliant article – seriously, well done. This probably says more about me than about Ed, but here goes: At a conference in Copenhagen (in honour of Igor Novikov’s 60th birthday) back in 1996, the seating order at the conference dinner was fixed. (I think this is a great idea and should be the case at all conference dinners—it gives on an opportunity to meet people one otherwise might not meet so soon; there are enough opportunities at conferences to meet people one already knows or wants to meet.) I ended up at a table with Werner Israel, his wife and Ed Bertschinger (and a couple of other people whom I don’t remember). At the time (I was but a wee lad myself), I didn’t know who Ed was. I assumed he had just completed his doctorate, perhaps, or maybe not even that. He just looked so very young (so I was quite surprised at how good his talks was, in hindsight obviously due to experience). Some of the first papers I read during my time as a graduate student (~1985) were by Ed Bertschinger. I assumed he was an elder statesman in the field at that time, but it turned out the papers in question came from his PhD Thesis! I wonder how young he looked when writing his thesis! Of course, there is a huge selection effect as well, since academics have contact mainly with other academics. As pointed out on this blog before, most people who start off in academia don’t end up with an academic career, even most people who want an academic career don’t end up with an academic career. Due to the small number of permanent positions, being the right person in the right place at the right time has a lot to do with who makes it and who doesn’t. (There are also other factors which should and do contribute, and unfortunately in some cases some factors which should not contribute but sometimes do.) So, there are even more people who are deservedly not in an academic job and a few who maybe should be but, due to the luck of the draw, aren’t. I don’t think there are any names for these syndromes, though. I have long suffered from this syndrome and suspect I will be afflicted with it for many more years. It’s heartening to hear that others that one admires and respects also suffer from this. Changing discipline served to exacerbate the whole thing for me, though I could at least legitimately plead ignorance when asking questions during seminars. Curiously, the Part III of the Math Tripos has now been converted to a Master of Advanced Studies degree – retroactively!! I suspect that the rationale for not making this a degree (i.e. the way the course was funded from the local county councils rather than through what was at the time SERC) is no longer relevant. I should add that I don’t think having these feelings is entirely a bad thing, as long as you don’t get obsessed by them. For one thing it means you appreciate really talented younger people all the more, and motivates you to help them as much as you can to fulfil their potential. Or at least it does with me. Curiously, my own experiences at school were very different, and because of one slightly odd experience. When I was aged about 12 years one of our teachers was absent due to illness and no substitute teacher was available to look after the class. As a result, the class of 30-35 pupils was split into small groups and were dispersed to sit quietly at the backs of various other classes to carry on with their own studies individually. I was sent to sit at the back of a geography lesson for the remedial stream. This was for the small proportion of pupils in a very mixed ability comprehensive school who had failed completely in their academic studies and who were effectively beyond hope in their studies. I worked quietly on some Latin homework, but stopped after a while to watch the interaction between the teacher and the class. The teacher was trying to explain some issues about hill farming to a small group of 15-year-old pupils. The students then tried to answer some basic questions in their exercise books. They kept asking the teacher to explain some very basic point that he had already answered several times. What I noticed was that the pupils in the remedial stream were totally unable to process simple information they had been given. They were incapable of any academic performance. They seemed wholly stupid when judged by their inability to handle basic academic information. Yet they were fairly normal human beings. They would, presumably, have been able to have conversations about whatever enthusiasms they had, such as football results or popular television programmes. They would have been able to process information they were familiar with or had some interest in. The stark conclusion that came from that experience was that what separated the people in the remedial stream with their complete failure at school and me working on my Latin homework was that I had become practised at handling information and had put in the effort to develop those skills. I had, presumably, come from a family which had respected learning to some degree, had developed some interested in school work, and had motivated myself to learn how to learn. The others had none of these. I became convinced that intellectual ability is determined far more by hard work, enthusiasm and a determination to study, rather than an inherited ability. That gave me an intellectual confidence that I could match any other person if I were prepared to put in the hard work necessary, as indeed anybody else could. So I was not intimidated on going to university, even though I was the first person in my family to go. Now, opportunity is a very different issue. Very good article. This is very common. I remember reading something from Feynman that suggested he had this when first starting teaching. Also Doyle’s statement that only talented people recognize genius but mediocrity sees nothing higher than itself. Feelings of inadequacy require talent. Perhaps their absence would be more worrying than their presence. Mr Coles, may I congratulate you on yet another interesting contribution ! As a non-physicist, I hardly speak the language of physics (only basic “grammar and vocabulary”, let’s say) but this blog gives a very good insight into the life and mind of a cosmetologist, oops sorry, cosmologist. The impostor syndrome and the Dunning-Kruger effect also appear in corporate culture, of course, and then there’s the Peter Principle (this is not personally intended, by the way), Parkinson’s Law of Triviality, Sayre’s Law, etc. Keep up the excellent blogging work. i agree that “luck” has a lot to do with career progress, but i think it also depends on how well you exploit those lucky breaks. if you see an opportunity and exploit it well – is that luck or bryn’s hard work? i think very few people get to a senior position without some hard work along the way… and some of them might have also benefited from some “luck”. I’ll refrain from questioning your choice of statistical terminology, but I will say that I think part of the deal with “luck” is that you don’t benefit from it unless you’re prepared to take a bit of a risk. I’m certainly fortunate in that the career decisions I’ve made have all turned out well, despite the fact that I didn’t really know what I was doing. The problem with luck is that it is a random process. When good luck comes along, good people will exploit it and will succeed. The problem is that lucky breaks will not come to some people; and some other people will have the bad luck that people in positions of power over them who should be offering support will do nothing, or in some cases will choose to take actions to frustrate them. The problem with the academic careers system is that luck plays too important a part. The careers system would be far better if people were given more freedom and choice, rather than having to rely on lucky breaks. For example, postdocs should be given more freedom to choose objectives and how to reach them. Postdocs should hold travel and some equipment funds so that they can initiative expenditure when they deem it desirable, rather than waiting for grant holders to authorise it. People should be able to apply for fellowships on their own initiative without needing the support of a university department, with all the political considerations introduced by research group and departmental nomination. I think Pasteur’s comment about luck favouring the well prepared is relevant here. In other words, one usually needs both; without preparation, luck can go unused. If anyone is interested I can relate how Bergman shot the final scene in The Seventh Seal, which is a good example of this. i wonder whether Phillip’s point about a selection effect in academia isn’t an example of the latter? i’d have thought the Imposter Syndrome must be just as prevalent in law, healthcare, finance, etc. P.S. Been waiting to get that joke in. I don’t follow you. If by the latter you mean “mindboggling levels of arrogance”, do you mean that it is arrogant if one is not in academia but thinks that one should be? If not, what do you mean? Outside of academia, there are just many more job opportunities. As such, it is much easier to gravitate towards one’s perceived place, i.e. into a job which matches one’s perceived abilities (whether or not this perception is correct). In academia, luck plays a much larger role in getting a job, so when one has a good one, one tends to stay there, even if one thinks of oneself as an imposter. This is strengthened by the fact that essentially everyone in academia has his ideal job while this is not true of all, and probably not even of the majority, of people outside academia. Life is what happens to you while you’re busy making other plans. I’ve actually been thinking about this a fair bit recently, and want to suggest something. Essentially, there’s “weak” imposter syndrome that – as you point out – almost every research does/should feel. We *are* a highly selective group of really clever, really motivated, and inventive people, and feeling the “dumbest person in the room” is very common. However, there is also a “strong” imposter syndrome where you attribute all your successes to luck (prepared or otherwise) and all your failures to yourself. This, for me, is a much deeper and darker issue, and one that I don’t think the community as adequately recognised or addressed yet. Would be delighted for more discussions here; it is very important. Consider how lucky you are that life has been good to you so far. Alternatively, if life hasn’t been good to you so far, which given your current circumstances seems more likely, consider how lucky you are that it won’t be troubling you much longer. There’s a lot of triggers in the real world that will reinforce the feeling of being an impostor. I can’t seem to find anything that does the opposite. From your experience with IS, would you have any specific tips or pointers on how to overcome, or at least to minimize the effect of this condition? Let me please remind potential commenters that I require a proper email address (which will not be displayed) to be given as identification.